Slovenia The Republic of Slovenia has a long history of hemp and cannabis use, and has long been a transit point for cannabis grown in Albania and transported to western Europe. Currently, industrial hemp is widely grown, and consumption of cannabis itself is not criminalized. The consumption of cannabis (or indeed, any other drug) is not considered a criminal offence in Slovenia, and is not punishable by law. Cannabis is the most widely-used illicit drug in Slovenia, and the retail price for a gram of high-quality indoor cannabis is reported to be in the region of €8. According to the European Monitoring Centre for Drugs and Drug Addiction (EMCDDA), possession of cannabis or any other illicit substance, in any amount, is subject to a fine of €200–€265. However, somewhat confusingly, it then goes on to state that possession of a “smaller quantity for one-off personal use” is subject to a fine of €40–€200. If the individual voluntarily enters into a treatment or rehabilitation order, the fine may be waived or reduced. The sale of cannabis is illegal under Slovenian law, and is subject to custodial sentences of 1–10 years. Aggravated circumstances, such as supply within school premises, are subject to custodial sentences of 3–15 years, and involvement in a criminal organization increases penalties to 5–15 years. Sentences may be suspended if certain measures are met, including participation in treatment or rehabilitation orders. Cultivation of low-THC (less than 0.2%, as per EU regulations) cannabis on an area smaller than 0.1 hectares is legal in Slovenia, and does not require a license. Cultivation of low-THC cannabis on an area greater than 0.1 hectares is legal, but requires a government license. Cultivation of high-THC cannabis is illegal, even for medical purposes. However, in practice it appears that a thriving subculture of cannabis cultivation takes place in Slovenia, and that the law regarding THC limits for small crops is not necessarily well-enforced. On the other hand, there are reports of individuals who had their crops seized despite the fact that they truly were growing low-THC hemp and not cannabis! 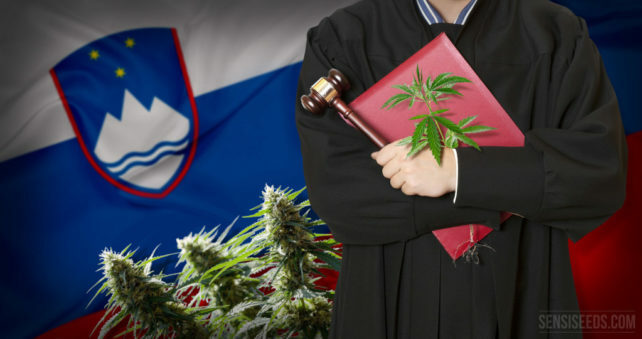 It is reported that around a decade ago, the vast majority of the cannabis sold in Slovenia originated in Albania, but since the passing of lighter penalties for possession in 2008, the country now produces 80-90% of its cannabis domestically. Medicinal cannabis does not yet exist in Slovenia, in legal terms. In recent years, the small nation has had intense debate over the potential of medical cannabis, even bringing the famous activist Rick Simpson to debate the pros and cons in a parliamentary session in 2012. Indeed, it seems that the oil has been available in Slovenia for some time, since Simpson travelled there to share knowledge on how to produce it at the World Hemp Congress 2012 in the town of Lendava, and it seems that there are multiple people benefitting from its use, although no data is available. In recent years, the ban on medical cannabis has been challenged by the appearance of cannabis social clubs in Slovenia, of which the most notable is Slovenski Konopljin Socialni Klub (SKSK). SKSK has put consistent pressure for legislative change on the Slovenian government, and there are signs that it may be beginning to pay off. The perceived benefits of medical cannabis are becoming well-enough known that increasing calls are being made for its availability in Slovenia. In February 2014 two medical bills were rejected by the parliamentary Health Committee, but just months later in June 2014, the government of Slovenia adopted provisions allowing for the supply of medical cannabis after all. At this stage, it appears that a supply framework has not yet been established. Officially, the hemp industry is just 10 years old in Slovenia, as the nation joined the European Union in 2004 and accordingly adopted its laws and regulations, which of course included the industrial hemp laws. Since then, the nation has embraced the revival of its ancient harvest traditions, and in many ways seems to be determined to keep them exactly as they were in the past, even going so far as to harvest fields by hand and incorporate pagan ritual into their harvest ceremonies. The enthusiasm and belief in the movement among many of Slovenia’s hemp industrialists is striking, and it is clear that this is an industry that is here to stay. Just outside the capital city of Ljubljana, situated in low-lying, fertile land in the middle of a national park, lies the Country Estate Trnulja – a fully organic working farm, which comprises fields (which can be toured by arrangement) of hemp, a restaurant that produces delicate hemp-based dishes directly from the crops the farm produces, and even a number of beautifully-designed chalet-style apartments that can be rented throughout the year (except February, when owners Urša and Miha are on holiday). Tourism in Slovenia is fairly underdeveloped, and as such, the country is ideal for the development of small eco-tourism resorts that are well-designed to be in keeping with (and possibly even benefit) their environment. Country Estate Trnulja is an ideal example of this, and in coming years, hemp tourism in Slovenia may really become established.